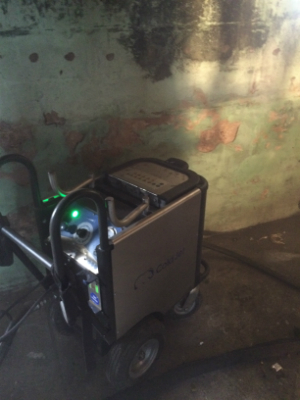 There are multiple applications for dry ice blasting on your property due to its cost efficiencies and safety in use. Fire damage removal, safe removal of mold, efflorescence removal, food service industries, printing industries, and electrical generation industries are just a few examples of applications for dry ice blasting use on residential and commercial property. Rainbow International is a full service restoration company affiliated with a national network, has over 30 years of experience and has built a solid reputation for producing quality work. With a commitment to education and embracing the most modern technologies in restoration, you can be assured that your job will be done correctly in a timely manner. Servicing the Elkton, Pikesville, Joppa, Cockeysville, Bel Air, Baltimore, and the greater Northeastern Maryland area, we have built our reputation upon excellent customer service, great references and quality workmanship. If fire, mold, rust or other types of cleaning are needed on your property, give Rainbow International a call at 410-836-2445 to discuss your dry ice blasting options. Dry ice is the solid form of carbon dioxide. During the cleaning process of Dry Ice Blasting, dry ice is used in a pressurized air steam and directed at a surface in order for effective cleaning. 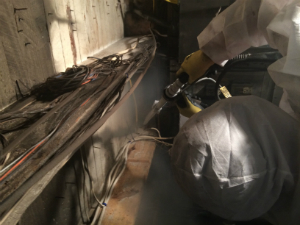 Dry Ice Blasting causes minimal abrasion as compared to sand blasting, plastic bead blasting, or soda blasting. As a result, the surface dirt flakes off easily, due to the amount of heat that is produced during the process. In addition, less waste is produced, with maximal abrasion and cleaning. 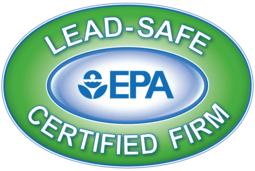 Dry Ice Blasting is recommended by the EPA over other types of solvent- based cleaning. For equipment with many different and complex shapes / geometries, Dry Ice Blasting can clean it all at once, without leaving a lot of residue. Dry Ice Blasting produces less waste products, as the dry ice material itself does not have to be cleaned up after using it. The only cleanup needed would be the material removed as a result of the cleaning. When would you use Dry Ice Blasting for Cleaning? If you need to clean food processing equipment and eliminate contaminants such as Salmonella, E Coli, and Listeria monocytogenes, Dry Ice Blasting may be your best bet. This process may also be used for equipment cleaning without having to disassemble it, resulting in the elimination of fire or electrical hazards. You would also use Dry Ice Blasting in the event that rust or ingredients that have accumulated on your equipment. In the past, companies used different media such as sand or soda; but those technologies would leave scratches or abrasions on the equipment cleaned. With dry ice blasting however, the co2 provides a gentler cleaning process and avoids any damage to the equipment. Last but not least, dry ice blasting is typically used when removing mold stains, water damage stains and soot from fire damage. Usually, these stains are extremely time consuming to remove, but with new emerging technologies, can be addressed relatively quickly. What types of Personal Protection are required? Although this is an effective cleaning option, care must be used during the process. Carbon dioxide becomes increasingly toxic in concentrations above 1%. It can easily replace oxygen and cause asphyxiation, so our professionals make sure we conduct the process in a ventilated area, along with exhaust vents present. We use insulated gloves, as well as eye and ear protection. 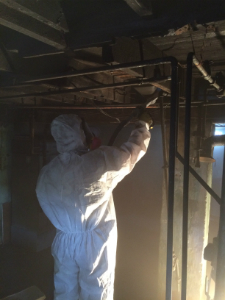 Safety is key, but when executed correctly, dry ice blasting is a cost-effective and safe solution to your cleaning needs. Take Action! Call Rainbow International Today! If you have experienced damage to your property from a fire with massive amounts of soot and grime left behind, mold damage to your home, or rust accumulating on equipment , give Rainbow International a call. We use a much more environmentally friendly process, approved by most insurance companies that is gentle in its approach and provides a safe and economical cleaning solution. Servicing the Elkton, Pikesville, Joppa, Cockeysville, Bel Air, Baltimore, and the greater Northeastern Maryland area, our technicians are fully trained in the techniques and skills required to properly mitigate your property. Give Rainbow International a call and see what we can do for you! For a free estimate, or more information, give us a call at 410-836-2445 to discuss your unique cleaning situation!